Seattle’s Ballard Locks ~ One of Seattle’s biggest tourist attractions offers the venue’s English Botanical Gardens free of charge. You have a choice of four possible ceremony locations at the Gardens and the space is free with a reservation. For more information and/or to make a reservation contact The Ballard Locks. Leschi Waterfront Area ~ For a short and sweet wedding ceremony, consider the beautiful Leschi waterfront area on Lake Washington as a definite possibility. This neighborhood area along the shore of popular Lake Washington is especially gorgeous and scenic during Seattle’s beautiful Summer months of July and August. Top of The Space Needle ~ What about getting married high in the sky at the top of The Space Needle? Purchase a ticket for you, your Sweetie, two witnesses and your Officiant to ride the elevator and you can be married at the top of the Needle with a killer view of Seattle all around you! Alki Beach in West Seattle ~ A favorite for locals and couples coming into Seattle from out-of-town is Alki Beach in West Seattle. For a short and sweet wedding ceremony, Alki Beach offers a bustling beach with lots of local color and activity. Couples love to get married at the water’s edge with their feet in the sand and the skyline of Seattle in the background behind them. 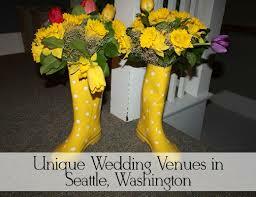 Contact the Seattle Parks and Recreation Department for a permit for a beach wedding. A Friend’s Boat on Lake Washington ~ It’s amazing how many people in Seattle have a boat or know someone with a boat. Take your wedding ceremony to the water and get married on a friend’s boat while cruising Lake Washington or the Puget Sound. Your Home or a Friend’s Home ~ This suggestion is probably a “no brainer!” What about making things as simple as possible and inviting your Officiant/Minister and family/friends to join you at your home or a friend’s home for a casual and simple wedding celebration? Home weddings in Seattle are as popular as ever and such location/venue might just be perfect for what you thinking as you plan your wedding day. At The Top of Seattle’s Historic Smith Tower ~ A very fun place for a small ceremony is at the top of the historic Smith Tower in downtown Seattle. Get married high in the Seattle sky with gorgeous views behind you. The Smith Tower is one of Seattle’s oldest buildings and is a perfect venue/location for a small and intimate lifetime event. Kerry Park Located on Queen Anne Hill/Seattle ~ This location for a wedding is as picturesque as they come! This is a fantastic spot for a very small ceremony (5-10 guests) and offers a fantastic spot for a small Seattle wedding. You won’t have much privacy given how many tourists frequent this very tiny park but this could just become part of your wedding story. Get Married in a Tree house ~ Really! Go take a peek at Tree house Point located in Issaquah, WA, which is just a short hop from downtown Seattle. This unique venue offers luxury tree houses for overnight stays and hosts small and intimate gatherings in the trees. The Kirkland Waterfront ~ Just across the bridge from downtown Seattle is the little “Sausalito of the Seattle” called Kirkland, WA. Lining the Lake Washington waterfront, Kirkland offers many picturesque piers and waterfront locations for a wedding ceremony. Best of all, there are wonderful restaurants and hotels within walking distance for a celebration lunch or dinner. Marymoor Park for Dog Lovers ~ If you are a dog lover, what better place to be married in the Puget Sound area than “doggie heaven” at Marymoor Park, in Redmond, WA. This amazing and gorgeous park is perfect for a wedding ceremony and if you really want to create a special memory, get married in the dog area of Marymoor Park and you’ll have more canine guests than you can imagine! Volunteer Park ~ Volunteer Park on Seattle’s Capital Hill is truly a hidden gem for a wedding ceremony and celebration. This local favorite offers a couple and their family and friends a remarkable venue for a lifetime moment. Ask about the “big tree” behind the Asian Art Museum and getting married under this 100+ year old tree! Contact the Seattle Parks Department about permit considerations. Magnolia Bluff ~ The Magnolia Bluff is a gorgeous location for a wedding ceremony. It does not offer a reception opportunity and it is one of the most special locations in Seattle for a small wedding ceremony. Washington State Ferry ~ How about getting married on a Washington State Ferry? The Seattle-Bremerton route and the Seattle-Bainbridge Island route both offer a very fun and lively opportunity for a wedding ceremony. When you pull into either Bremerton and Bainbridge, there are wonderful restaurants within walking distance. For Bainbridge Island, check out Four Swallows Restaurant. For Bremerton, take a peek at Anthony’s Homeport restaurants. Both are celebration meal favorites! Hamilton Viewpoint Park/West Seattle ~ This is a small and sweet neighborhood park that hosts wedding ceremonies of all sizes. The nearby venue, The Sanctuary at Admiral, is a perfect venue for a party after your ceremony at this “high bluff” park which overlooks Seattle. Seattle Aquarium – Fish everywhere! The Seattle Aquarium hosts dozens of wedding ceremonies and celebrations each year. The Aquarium, on Seattle’s waterfront, is a very unique venue and is quite the conversation starter! Washington Park Arboretum ~ This amazing Arboretum is a perfect venue for both a ceremony and celebration. The Arboretum is filled with meadows, walking trails, ponds, waterfront and gorgeous views.